This is the second part of The Cardinal Nation’s monthly two-part series as we name our Players and Pitchers of the Month across the St. Louis Cardinals organization. While the Cardinals recognize their top players as well, we undertake our own independent analysis unencumbered by the organization’s selection criteria. Let’s get right to it with a look at the list of August system-wide hitting leaders. While a number of hitters in the Cardinals system had strong Augusts, one position player distinguished himself from the rest, utilizing a terrific stretch of hitting to help win a league Triple Crown. Our August Player of the Month is DSL Cardinals Blue third baseman Malcom Nunez, who should also have a strong case to claim the still-to-be-announced Cardinals Minor League Player of the Month award. Despite appearing in only 22 games in the already-completed DSL regular season, Nunez made the most of his time in the field and then some. He led the system with a .840 slugging percentage, .505 on-base percentage, 1.345 OPS, 16 extra-base hits (nine doubles and seven homers), 65 total bases, and a whopping 34 RBI (next closest 24 RBI from Johnson City first baseman Leandro Cedeno, who had 23 more at-bats) among hitters with at least 60 at-bats. The 17-year old also was second in the organization with a .420 average (34-for-81) among qualifying hitters, helping him win the DSL Triple Crown for the season despite missing nearly half the schedule due to being a July 2 signing. He finished the year hitting .415 with 13 homers and 59 RBI. Not only that, the Havana, Cuba native was the first DSL batter in at least 13 years to hit .400, and also the first to slug at least .650 in a season at that level. The Cardinals signed Nunez for $300,000 just two months ago. He is viewed as a strong, physical player with plus raw power and a huge arm at the hot corner coupled with an exceptional track record for performance. “We are pleased to sign a hitter of Malcom’s caliber and viewed his bat among the best available,” Cardinals Assistant General Manager Moises Rodriguez told MLB.com on July 2 after Nunez’ signing became official. 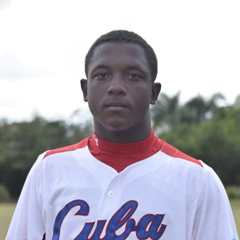 “He has a track record of performing at a high level in both Cuban youth leagues and international competition, where he stood out among his peers. In TCN’s recent monthly re-rankings of Cardinals Top 50 Prospects, Nunez debuted as our No. 38 prospect. He almost certainly should get a shot at playing state-side at age 18 in 2019. Runner-up to Nunez is Joerlin De Los Santos, who hit a system-best .439 with an impressive 1.175 OPS, including eight doubles, four triples, and eight driven in this past month The 17-year old center fielder also swiped nine bags for the DSL Cardinals Red and posted a solid strikeout to walk ratio of 8-to-7 over 66 at-bats. Another worthy mention is GCL Cardinals outfielder Jhon Torres, who produced a robust slash line of .397/.493/.687. Torres, who is one of two prospects acquired by the Cardinals in the Oscar Mercado trade on July 31, launched four homers and hit the gaps for doubles six times while knocking in 14 runs in 63 at-bats. Back at the Academy in the Dominican once again, DSL Cardinals Blue outfielder Darlin Moquete also put together a quality month at the dish with a .388 average, albeit with less impact as his peers above (.899 OPS) over 85 at-bats. Also, DSL Cardinals Red shortstop Franklin Soto hit .379 with a .941 OPS in 66 at-bats. Two more DSL Cardinals Red position players with strong months are Francisco Hernandez (.351/.430/.473 in 74 at-bats) and Luis Montano (.344/.408/.541 over 61 at-bats). At the other end of the system, Memphis had a pair of hot hitters from this past month in Rangel Ravelo (.339 average and .819 OPS despite finishing one at-bat short of qualifying to be considered) and Wilfredo Tovar, who hit .333 with a .847 OPS. Johnson City was led by Cedeno, who slugged six homers and drove in 24 runs, which ranked second in the Cardinals system for August. He finished with a 1.036 OPS over 98 at-bats. JC’s Liam Sabino hit a sturdy .339 with 10 extra-base hits and 11 RBI through 62 at-bats. Once the Labor Day weekend was over, on Tuesday, September 4, the Cardinals organization announced their top player choices for August. Obviously, we agree! #STLCards name INF Malcom Nunez (DSL Cardinals Blue) & RHP Jake Walsh (Palm Beach-A) Minor League Pitcher and Player of the Month for August. Nunez hit 5 HR in final 7 games to win the Dominican Summer Lg Triple Crown (.415, 13 HR, 59 RBI). Walsh was 2-2, 1.38 ERA in 26.0 IP.